Easy Feet cleans and massages your feet from heel to toe! No more bending or reaching to clean your feet with Easy Feet. It secures to any tub or shower. •Use it for thirty days and you will see the difference. It's like getting a pedicure everyday! •Features over 1,000 rejuvenating bristles to clean and massage your feet, a built-in pumice stone for rough and cracked heels and built in suction cups to hold it in place. •Built-in pumice stone for rough cracked heels. •No Slip Cups that Stick to any surface! 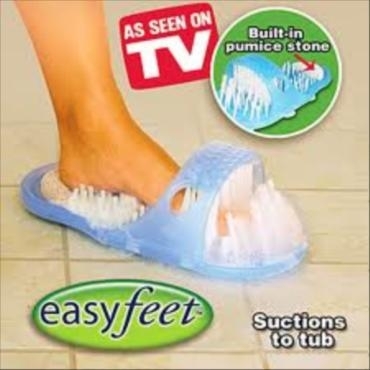 •Over 1,000 rejuvenating bristles clean and massage your feet! 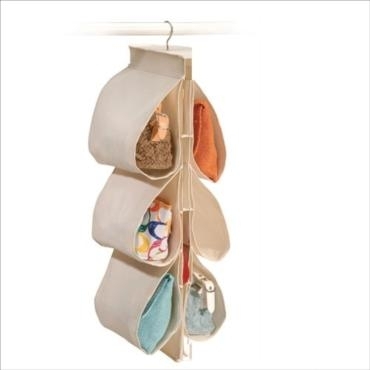 •These organizers will keep every girl’s sparkly trinkets properly organized while not in use. 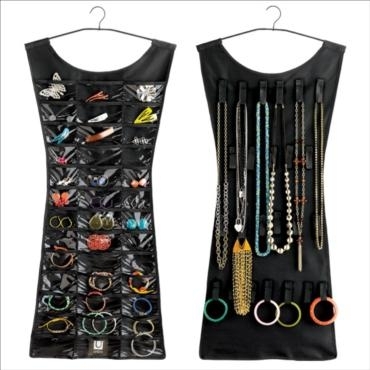 Taking on the unmistakable shape of a girl’s little black dress, this organizer will merge very well in your closet. While one side houses transparent pockets that will hold earrings and pendants, the other side features loops that will hold necklaces, chokers and bracelets. The organizer is made of vinyl so that it is easy to see all the jewelry within. Best of all, it takes up little space and keeps your precious pieces safe and organized.